On November 4th, in Hanoi, the Committee for Ethnic Minority Affairs associated with the Ministry of Education and Training and Ho Chi Minh Communist Youth Union launched the Commendation Ceremony for the outstandingly excellent ethnic minority pupils, university students (DTTS) in 2017. The member of Politburo, Deputy Standing Prime Minister Truong Hoa Binh attended and gave a speech at the ceremony. Attending the ceremony, there were the members of the Party Central Executive Committee; the President of Vietnam Fatherland Front Committee Tran Thanh Man; Deputy President of the National Assembly Phung Quoc Hien; President of the Ethnic Council of the National Assembly Ha Ngoc Chien; Minister, Chairman of the Committee for Ethnic Minority Affairs Do Van Chien; Deputy President of the Standing Board of the Central Commission for Mass Mobilization Thao Xuan Sung; Director General of the Viet Nam News Agency Nguyen Duc Loi; alternate Member of the Central Party, First Secretary of Ho Chi Minh Communist Youth Union Le Quoc Phong. Leaders of Ministry of Education and Training; The Deputy Ministers, Chairmen of the Committee of Ethnic Minority Affairs; leaders of departments, units of the Committee of Ethnic Minority Affairs also attented the ceremony. This year, the Commendation Ceremony honored 161 outstandingly excellent ethnic minority pupils, university students. 95 students achieved the second, third and encouraging prizes in the National Excellent Student Contest; 62 students had high score on the National High School Graduation Exam; 04 students achieved Medal in the international sport contest in Southeast Asia and Asia. These outstanding ethnic minority pupils, university students come from every corner of Vietnam. They are the good examples of hard-working, overcome difficulties to have a better life. Giving the speech at the ceremony, the member of the Central Party, Minister and Chairman of the Committee for Ethnic Minority Affairs Do Van Chien emphasized: The Party and Government always consider education – training is the most essential national policy. All agencies, parents and the society always take care of the development of education and training in ethnic minority and mountainous areas, regions have special difficulties. Governmental budget has spent thousands of billions VND to build schools, classes; buying equipment for teaching and learning purposes, support rice and money to buy food to let ethnic minority students have difficulties can study and so on. The school network have been widely developed, the rate of student graduate is higher and higher, the quality has been increasing; making a contribution to increase the rate of cadres, officials are literally minority people, step by step meet the demand of the socio-economic development of the locals. However, the ethnic minority and mountainous areas are still the poorest region and have many difficulties in the country. Thereby, developing education and training, advancing the intellectual’s standard, the quality of the human resource are the practical solutions to develop socio-economy in a rapid, sustainable way in the ethnic minority and mountainous areas. On this occasion, Minister, Chairman was hoping pupils, university students commended not to satisfy too much with this result, always industriously learn the culture, professional knowledge, language, IT, soft skills to have a job in the future, guaranteed income to secure their life and help their family, country. Minister, Chairman sent a message to pupils, university students: “The rule of life is tough, there is no place for people who not to try their utmost; any success comes from a serious learning and working process; hard-working, becoming good students are the practical actions to help yourselves, your family and country to lift out of poverty, slow developing pace”. On behalf of the Party Civil Affairs, leader of the Committee for Ethnic Minority Affairs, Vietnamese Ethnic Minority Communities, coordinate agencies, the Minister, Chairman Do Van Chien thanked the Party, Government leaders took care, developed the education and training. Especially the effects of teachers who overcome daily difficulties, have strong attachment to the hamlet, village and teaching them to become a good individual; thanked central committees, ministries, agencies, locals, the media, sponsors coordinated, helped to have a success ceremony. 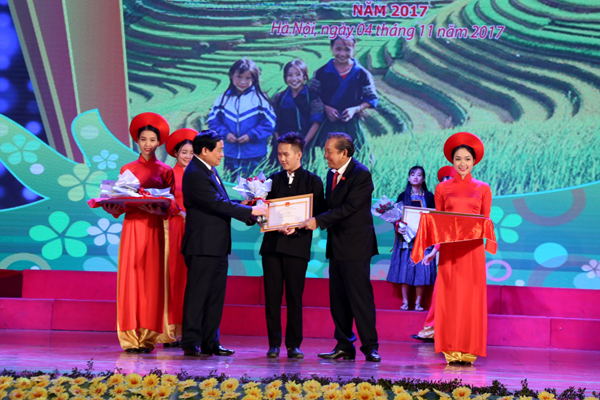 Giving the speech at the ceremony, on behalf of the Government and Prime Minister, the Deputy Standing Prime Minister Truong Hoa Binh congratulated, commended the outstandingly excellent ethnic minority pupils, university students commended in 2017. The Deputy Prime Minister also commended and acclaimed the ethnic minority pupils, university students have excellent achievements to encourage students to study, make contribution to advance the quality of human resource for the ethnic minority and mountainous areas. The Deputy Prime Minister emphasized that the ethnic minority and mountainous areas are still the most difficult region in the country. To develop the economy, lift people out of poverty, the best solution is developing education. He also proposed: the Committee for Ethnic Minority Affairs, Ministry of Education and Training continued to check, research, and counsel with the Government to complete the policy about developing the ethnic minority human resource. The Executive Committees of the Party, Government and organizations continued to set a condition to develop the education, create policies help the teachers and students to have better condition. Education in the ethnic minority and mountainous areas needs to have a basic and comprehensive change in the content, educating method to let the students become fully-developed citizens. Uncle Ho said “Vì lợi ích trăm năm trồng người”, schools need to synchronize the solutions to create the friendly, total educating environment in moral sounds, knowledge and behaving culture in daily life; build the better teachers and managing educational operators. The Deputy Prime Minister sent message to the students: the young generation is the masters of country in the future; they need high determination to have a position and job in life, make contribution to the homeland, become a good citizen, create a firm foundation for themselves, make contribution to society. The outstandingly excellent ethnic minority pupils, university students will be the cadre, examples for other ethnic minority students in the country. The Deputy Prime Minister hopes pupils, university students always studiously strive to become a good citizen, affirm the Vietnam position in the world. He hopes the ethnic minority and mountainous areas will have more excellent student, bringing honor to the homeland.